Q: More than 200 people are reported to have been killed, 159 missing and 70,000 displaced since the tropical storm Tembin swept through Mindanao island of the Philippines on December 22, causing secondary disasters like floods, landslides and mudslides. Has China sent messages of condolence? Will China offer assistance for disaster relief to the Philippines? A: The tropical storm Tembin that hit the southern Philippines in recent days has caused great casualties and property loss. President Xi Jinping has sent messages of condolence to President Duterte. We stand ready to offer disaster relief assistance to the Philippines to the best of our capability. We believe that under the leadership of the Philippine government, people in the affected areas will tide over the difficulties and rebuild their homes soon. 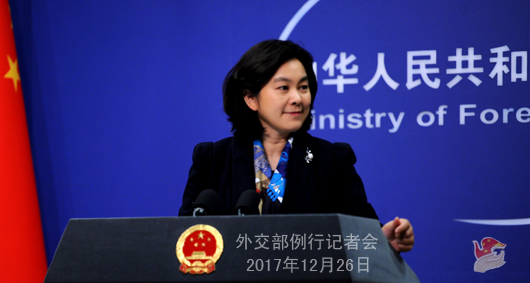 Q: It is reported that according to the November figures of oil exports from China to the DPRK, it seems that this month there were no exports of oil products, including jet fuel, to the DPRK. Can you confirm it? A: I am not aware of the details as you mentioned. 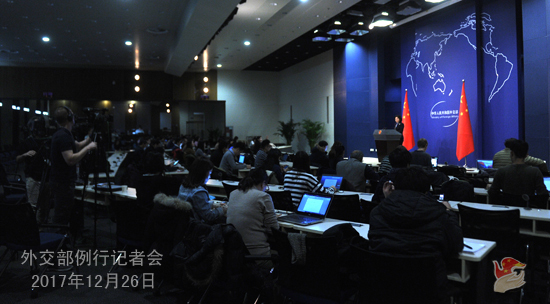 In principle, China always fully, accurately, faithfully and strictly implements the DPRK-related resolutions adopted by the UN Security Council. We have established a set of effective and functional mechanisms and practices. Q: Reports from India say that the landslides caused by earthquake in Tibet Autonomous Region may have caused problems in water quality in the Brahmaputra river. Has this been discussed in recent talks between the two countries? A: The preliminary investigation carried out by the relevant Chinese department shows that the situation you mentioned was caused by natural factors in the far-flung, uninhabited areas near the disputed region along the east section of the China-India borderline, rather than man-made incidents. We noted that the specialized department on the Indian side also analyzed and clarified the situation. We hope that the Indian media shall not make these speculations before getting the facts straight. In the meantime, China remains in contact with the Indian side through existing channels on the issue concerning cross-border rivers. Q: According to reports, Japan is planning to import the F-35B fighters and refit the helicopter carrier Izumo into an aircraft carrier. What's your comment on the relevant moves? Is China concerned that this may fuel a new round of arms race in Asia? A: Due to historical reasons, Japan's moves in the field of military security have been closely followed by its neighboring countries in Asia and the international community at large. I saw some reports saying that Japan's likely move may contravene the Article 9 of the Japanese Constitution which is an important legal guarantee and symbol for Japan to follow the path of peaceful development after World War II as well as a solemn commitment it made to the international community. We urge Japan to adhere to the policy of "exclusive defense", stay committed to the path of peaceful development, act cautiously in the area of military security and do more to enhance mutual trust between regional countries and promote peace and stability in the region, instead of the opposite. Japanese officials have said over the years that Japan is a force for peace. We look forward to seeing that Japan act on these words with concrete policies and actions.